"Could you guys compress a little to the center? Thanks." I know I’ve said this a lot of times already, but let me just set the record straight: I’ve never left Team Shyamalan. I’ve always been a fan of M. Night Shyamalan. I’ve never left his side. Sure, he had misses, but he also had hits. Although The Village will still be my favourite Shyamalan flick, I’ve never fed the hate and vitriol directed at him when he came out with the live action adaptation of The Last Airbender. Yeah, it wasn’t great, but let’s face it, it wasn’t horrible either. It was just… not that good. Compared to his body of work, that is. But wait, this isn’t an article to defend Mr. Shyamalan. This is supposed to be a review of his latest film Glass. So here are three reasons why Glass is something worth watching. It’s the conclusion to Shyamalan’s trilogy you never knew existed. Let’s be honest here: How many of you knew when you watched Unbreakable back in 2000 that it would have a sequel? Nobody did. And when Split hit the theaters in 2016, how many of you figured out it happens in the same universe as Unbreakable before seeing Bruce Willis show up in the end? Again, nobody did – except Shyamalan, of course. The director really intended James McAvoy’s character to appear in Unbreakable, but had to cut him out. So Split can be considered a kind of spin-off in that sense. And thank God Shyamalan decided to give us Glass. We all love superhero flicks, and anything that doesn’t resemble a Marvel or a DC flick is a welcome treat indeed. It’s a superhero flick that doesn’t seem like a superhero flick. Honestly, this isn’t the best example of “a superhero flick that doesn’t seem like a superhero flick” – that distinction still belongs to Christopher Nolan’s Dark Knight trilogy. But in Nolan’s context, that means being grounded in reality, which works for the Batman universe because the characters there mostly don’t have super powers. In this universe, the characters do have superpowers: David Dunn (Bruce Willis) was unbreakable, meaning he had super strength; Elijah Price a.k.a. 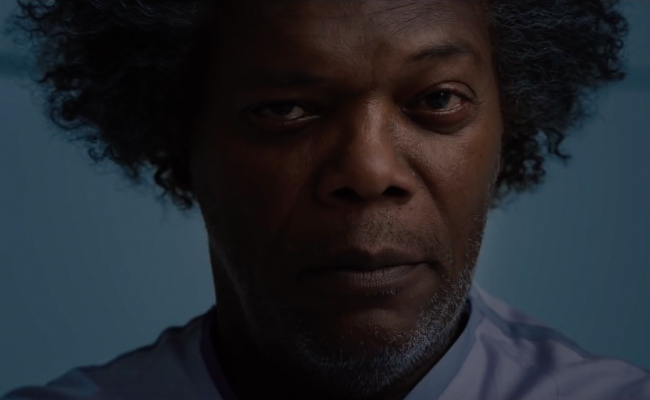 Mr. Glass (Samuel L. Jackson) had supervillain intelligence; and The Beast (James McAvoy) had, well, beast-like powers (I wouldn’t consider his multiple personalities as a superpower, because that’s more of a disorder). Yet despite the superpowers present, the director still tried to present this as grounded as possible, because the entire premise of the films is that superheroes walk among us, and the comic book characters are based on real-life people. It’s got three great actors. Okay, Bruce Willis isn’t really a great actor. He’s good, but I wouldn’t call him great. I wouldn’t say he’s mediocre. He’s good. Let’s leave it at that. Samuel L. Jackson I would say was great. He even had those little facial twitches going on, which kind of made his condition more authentic in a way. But the show-stealer here was James McAvoy. From the weight gain and body building he went through, to the meticulous character changes that had even Samuel L. Jackson stunned, to the veins popping out his neck, McAvoy deserved an acting award nomination at least for his performance here. So, is this the end of this superhero series? It pretty much looks like it. Is M. Night Shyamalan going to venture into long form storytelling on the streaming platform? Maybe. But one thing’s sure: I am eagerly awaiting the day his next film hits theatres. And I’m pretty sure I’m not alone. "I'm still waiting for that Mace Windu origin story, Mr. Lucas Disney."